“Friendraising is raising money from your friends and family.” This is just one of the replies I got, when I recently asked app. 200 Dutch fundraising colleagues to send me their definition of ‘friendraising’. Well, if this is what friendraising is about, I guess the birthdays of fund- and friendraisers soon will be awfully quiet. Fortunately, a lot of colleagues used better definitions. Myself, I like to use this one: friendraising is building sustainable relationships with persons, foundations and corporations, in order to get to know them better, and to (co)create a wide variety of ways to support your organization. Of course, a result of friendraising can be that you receive money. But if it’s up to me, it can be so much more. Let me sum up just 6 things for you. Fun. Friendraising is fun! Not only for us, fundraisers, but also for NGO boards. Often I experience that board members find it difficult to ask for money. They feel like they have to get down on their knees, begging for a gift. As to fundraising, friendraising has a great advantage: it is all about connecting new friends to your organization. Well, that’s not scary at all. In fact, I bet that most of your board members are experts in making new friends. Changes are high that they were asked to join the board, just because of their large networks. So let’s put the fears aside, and start connecting friends to our mission! Relationships. When fundraising, we often focus on a one-time gift. We tend to put a euro sign on people’s foreheads, and make that the reason for approaching them to support us. But, when we see everyone as a prospective source of money, we ignore what it might mean to have that person as a friend. A friend, who can give us a 2nd, 3rd, or maybe even 4th gift. But friends can give you more: their time, their wisdom, or maybe even some in-kind gifts. Want to know what kind of support your friends can give you? There is only one way to find out. The only way to have a friend, is to be one. So let’s start building relationships with the friends that support your organization! Innovation. As Marcel Proust says ‘the only real voyage of discovery consists not in seeking new landscapes, but in having new eyes’. If you take off your fundraising glasses, and put on your networking ones, you will probably find out that you will get in touch with people you wouldn’t have met before. That you will have conversations, you wouldn’t have had before. And that, together with the (new) people you get in touch with, you will come to ideas you wouldn’t have had before. Friendraising creates an entrepreneurial state of mind, so let’s take off those fundraising glasses! Euros. Okay, okay. Being a warm and good friend, who focuses on building sustainable relationships, and who cooperates and listens to the people he gets in contact with, will be rewarded. Rewarded with a variety of gifts. Like some of the ones mentioned above. And like: euros. That’s why they say that friendraising comes before fundraising, isn’t it? Network. Let’s get on with the other things you can receive, when you start raising friends. While wearing your networking glasses, you will see that sometimes a new friend carries around something very special. It is the key to open the door of new networks. Because he is a member of a Rotary Club, a business club or he is just a person who happens to know a lot of other people who can be of great support for your organization. All kinds of networks he can get you in touch with. Where he can introduce you, by bringing you with him to a meeting, or by arranging a speaking gig for you. So let’s print some extra business cards and get in touch with those networks! Dialogue. One result of getting to know people better, is that you will start to have conversations. While having these conversations, you will find out why people support you. What, according to them, is so important about your mission, or about the projects you realize. You will learn if they speak to others about this, if they promote your organization to their network. Very useful information, because it can help you improve the things you do. So let’s stop seeing donors as a number in our database, and let’s start a conversation with the people behind those numbers! P.S. Feel free to come up with other things you can get with friendraising. Let’s try to finish what I’ve started, and complete the word: R-A-I-S-I-N-G. Who wants to give it a shot? Indeed, friendraising can be a very helpful concept for volunteers. A new way of approaching them, involving them, create sustainable relationships with them. And friendraising is not a helpful strategy for committing volunteers. 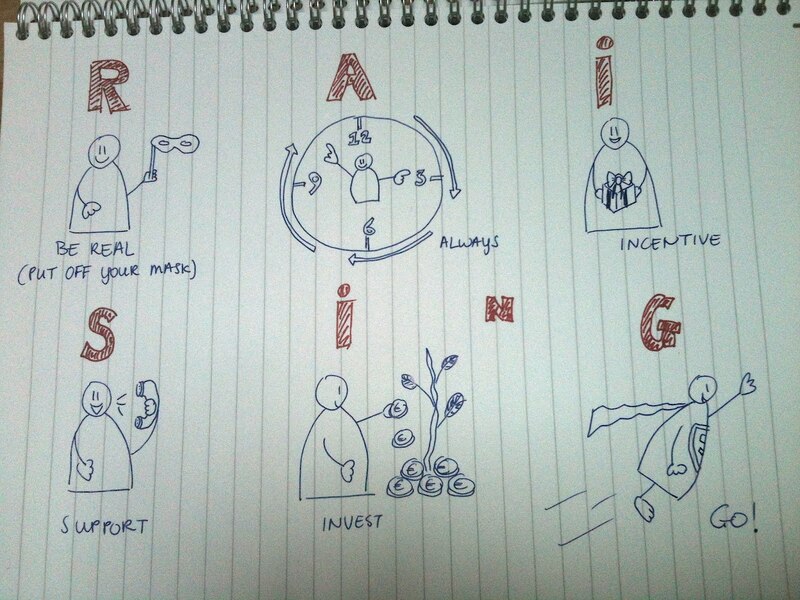 If it’s up to me, friendraising is a state of mind for every NGO employee, CEO, and board member. Thanks for your comment! Real – be real. This isn’t a trick or a play. This is what you are and where you stand for. Always – Friendraising must always be at least at the back of your mind. Pondering away like a little app. Incentive – What’s in it for the friends that come on board? Recognition, member of a group (LI, FB or otherwise) and a lot of good will. Support – be available for your friends and help them where you can to raise more friends. Invest – In a FB page, a corner of your website, periodic open coffee meetups, in a LI group. GO – Just GO and do it! Hm, that’s a good one. I guess the fact that it’s friday and my brain is tired, is the reason why I cannot come up with a good suggestion. Whenever I can think of a good one, I will let you know! N = for Names and Needs. You have to make sure that the message is clear and reconizable in a few words. G = also could be for Goal! You have to set a goal. People who are giving money need to know how their contribution is spend. Hello there, I was referred to your site by A friend in EWTN. I would love to talk to someone about sponsoring my programmes on radio Where my content is current affairs and Religous discussions . The listnership reaction is overwhelming and locally in Ireland and globally. My podcasts are now going live on the radios facebook page. Any direction you could give me would be great. Many thanks john. firstonline radio. 085 8642465. I need this word “friendraising” for our fundraising. thank you Vera P.
I glad to have found your 101Fundraising. Thanks again.